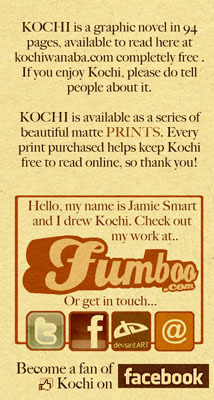 First off, I’d just like to say thank you so much for all the lovely support for Kochi, it’s been very appreciated! Now the story is starting to turn a little darker, i’m psyched to show you where it’s going to end up. Kochi’s a story I’ve been trying to tell for a long time, so now it’s slowly unfolding I’m enjoying it as much as anyone. I wanted to start answering some questions about Kochi. If we get a few i’ll turn it into a FAQ blog post in the near future, answering whatever questions you might have about it. Whether it be about the making of Kochi, about the story or characters, future plans for Kochi, ANYTHING you wanna know i’ll be more than happy to answer (spoiler-free, of course). So if there’s anything you want to know about Kochi, please leave your question as a comment under this blog post. I’ll then bundle them together and answer them soon! Doing the art for Kochi in pencil is an interesting choice. What was your thinking behind it? Is the story for Kochi autobiographical in any way? I mean, I know you probably didn’t find a dead girl in the woods with her face ripped off, but I just wondered whether any of the characters were based on yourself or anyone you you knew, and whether the settings were based on places you lived or visited? Great comic by the way! Nothin’ like beating a dead horse, but…any movement on the printed, bound copy. Are you hoping to do the book after all the pages are up here? Guess I’ll just have to wait. Love you, Jamie! theres alot of info on there 🙂 i also agree with you kochi and him have similar hair! and stuff. I was going to ask about a print copy too, but then that DASTARDLY TIM PARKER WHIPPED IT OUT FROM UNDER MY NOSE.